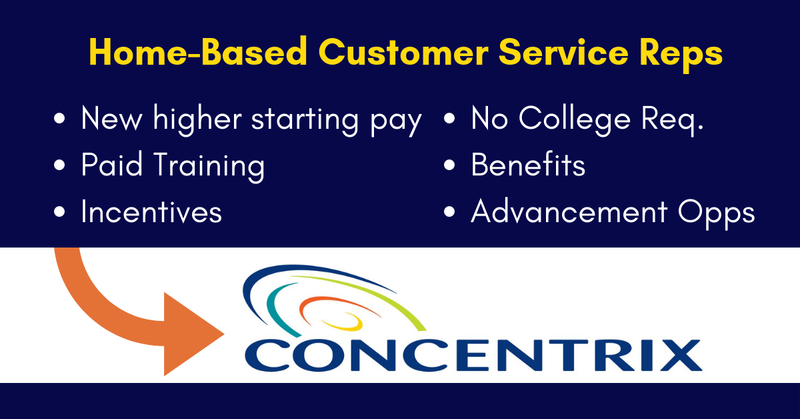 Concentrix, a legitimate company with a broad base of home-based workers, has posted openings for Full-Time and Part-Time Customer Service Representatives to provide great experiences for their customers. Many RRRebels have been hired by Concentrix. For the current jobs, they’re hiring nationwide except for the following: Alaska, California, DC, Hawaii, Massachusetts, Maryland, Missouri, Montana, Nebraska, New Jersey, Oregon, Vermont, Washington and Wisconsin. At Concentrix we are fanatical about our staff and clients. We are tenacious in our pursuit of excellence and of high quality service. We’re not afraid of being bold and disruptive in the marketplace and we like shaking things up. We take our values seriously and they are threaded into everything that we do – we are ONE CONCENTRIX. Join us and BE the Difference for the world’s best brands! Care about people? Join our upbeat, friendly Customer Product Support team to assist this leading edge, nationally-recognized, technology provider. Being a Concentrix Customer Service Representative team member can be an exciting, fast-paced career where you can go as far as your ambitions will take you. Concentrix is looking for people who LOVE making customers happy. We are a company filled with high energy people with a willingness to put the customer’s needs first. In this position, you’ll be fielding questions from customers of a large leading edge, nationally recognized technology company. You will be empowered to solve simple to complex issues for these customers. As a Customer Service team member, you get to hear the satisfaction from your customer after you help them. Motivation, Passion, Integrity. Those are just a few of the attributes valued at Concentrix. • A quiet, distraction-free, location in your home to work, with a door that closes. • A strong candidate will be computer/Internet savvy, comfortable operating in several applications simultaneously. • We need you to be a “people person” who enjoys talking and assisting others. Think about how much you enjoy receiving excellent customer service yourself? Well, we need you to take pride in providing that same great service to others. These items are not required as part of the application process, so please do not purchase them before we extend a job offer to you. Click here for full details and to apply for this position. For more jobs like these, check our Newest Jobs & Gigs page. To be the first to hear about jobs like these, like our Facebook page. Good luck in your next steps toward working from home! PLEASE SHARE this post – turn your friends into Rat Race Rebels! This entry was posted in Customer Service Jobs, Hiring Companies, Part-Time Jobs, Work at Home Jobs and tagged Concentrix. Bookmark the permalink.